Australia, the United States, Japan and New Zealand will fund a massive rollout of electricity and internet cable in Papua New Guinea as western nation’s hit back at rising Chinese influence in the Pacific with a united infrastructure drive to rival Xi Jinping’s signature Belt and Road Initiative. The transformational development investment, announced on the final day of this year’s APEC summit in PNG’s capital Port Moresby, will deliver power and fibre-optic to 70 per cent of Papua New Guineans by 2030. 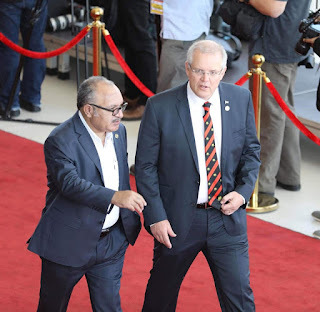 Scott Morrison signed a partnership agreement to deliver the project with PNG Prime Minister Peter O’Neill, US Vice President Mike Pence, Japanese Prime Minister Shinzo Abe and New Zealand Prime Minister Jacinda Ardern. “Papua New Guinea has invited Australia, Japan, New Zealand and the United States to work together to support its enhanced connectivity and the goal of connecting 70% of its population to electricity by 2030,” a joint statement said. Australia will contribute $25 million (US$18.2 million) in the first year to the 12-year multi-billion dollar project in the APEC host nation, which is one of the world’s most rugged and inaccessible countries. The announcement follows Pence’s announcement that the US would join PNG and Australia in the redevelopment and running of a joint naval base on Manus Island - slamming the door shut on the prospect of the China gaining access to the strategic deepwater port. The project was pitched as an “enduring economic and security partnership between our countries”. “This initiative will also be open to other partners that support principles and values which help maintain and promote a free, open, prosperous and rules based region,” the statement said. It’s understood Australia will lead the rollout of new hybrid cabling across PNG’s mainland. “Progress towards Papua New Guinea’s ambitious objectives will require large scale investment by both the public and private sectors,” the statement said. “Access to electricity is key to Papua New Guinea’s economic growth. Electricity lifts the living standards of communities in cities, towns and remote villages. It’s understood PNG will decide which power sources are used for the project. There is currently a debate in PNG over a potential new coal fired power station in a country where 70 per cent of electricity comes from hydro generation. The joint project follows Australia’s edging out of Chinese telco Huawei to roll out an international undersea internet cable from Australia to PNG and the Solomon Islands, amid security fears. Pence hit out at Chinese debt diplomacy in the region, saying nations risked their sovereignty by accepting Beijing’s loans.